تحميل المراجعة النهائية الافضل فى اللغة الانجليزية الترم الثانى للصف الاول الاعدادى ,مستر محمد الشعراوي. 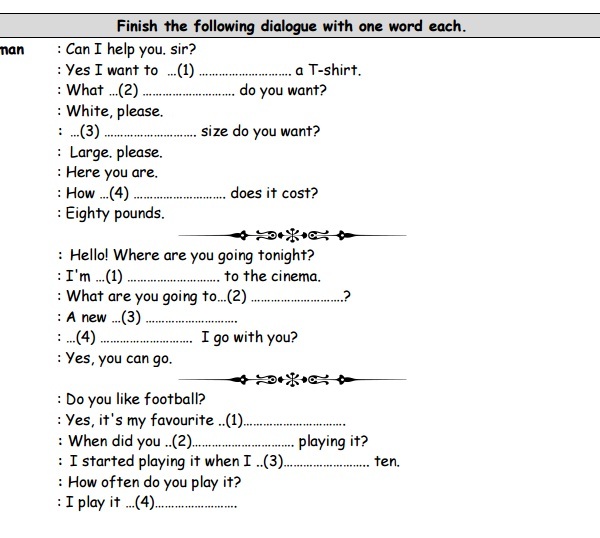 Finish the following dialogue with one word each. 1- Salesman : Can I help you. sir? Ali : Yes I want to …(1) ………………………. a T-shirt. Salesman : What …(2) ………………………. do you want? Salesman : …(3) ………………………. size do you want? Salesman : Here you are. Ali : How …(4) ………………………. does it cost? 2-Ahmed : Hello! Where are you going tonight? Adel : I'm …(1) ………………………. to the cinema. Ahmed : What are you going to…(2) ……………………….? Adel : A new …(3) ………………………. Ahmed : …(4) ………………………. I go with you? Adel : Yes, you can go. 3-Hany : Do you like football? Samy : Yes, it's my favourite ..(1)…………………………. Hany : When did you ..(2)…………………………. playing it? Samy : I started playing it when I ..(3)…………………….. ten. Hany : How often do you play it? Samy : I play it …(4)……………………. 4-Omar : What do you think the most important invention? Aly : IT is the …(1)……………………………. Omar : ..(2)………………………………….. was it invented? Aly : About 60 years ago. Omar : Do you …(3)……………. a computer or a laptop? 5-Doctor : Hello, Maha! What is the matter with you? Maha : I ..(1)………………….. my back. Doctor : When ..(2)……………………… you do this? Maha : I started after I ..(3)………………………some weights. Doctor : Did you …(4) …………………..your knees and lift the weight carefully? Maha : Yes, I always do that when I lift weights. 6-Dr Amgad : Hello Mohamed. What's the matter with you ? Mohamed : I ..(1)………………….. my ankle. Dr Amgad : How did it (2)........................... ? Mohamed : I fell down while I was (3)............................. football. Dr Amgad : Did you put some (4)...................... on it? 7-Hend : Mum, can I help you in the kitchen? Mother : Sure, Hend get me the …(1)…………………..
Hend : The …(2) ………………………. pan or the big one? Mother : The big one. Now turn on the….(3)…………….. Hend : What are you …(4)…………………. mother? 8-Ali : What a lovely watch! Did you buy it? Omar : No, I didn't buy it. It is a ..(1)………………. from my father. Ali : …(2) ………………………. did he give it to you? Omar : Because it ….(3)…………….. my birthday last week. Ali : Where is it …(4)…………………. in? 9-Heba : Where does your mother work, Dalia? Dalia : She works in a ..(1)………………. she's a nurse. Heba : A nurse! So she helps ..(2)………………. people? Dalia : Yes, what's your mother's ..(3)………………. Dalia : So, she works at a school? 10-Huda : Where did you go yesterday? Hind : I ..(1)………………. to the Pyramids. Huda : How ..(2) ………………. you go there? Huda : Who did you go ..(4)………………. ? Hind : I went with my parents. 11-Ahmed : What's your favourite sport, Hany? Ahmed : …(2) ………………………………….do you play it? Hany : I play it in the club. Ahmed : …(3) ………………………………….do you prefer football? Hany : Because it is a very …(4) ………………………………….sport. 12-Doctor :A healthy diet contains food from the five main food groups. Adel : What are the five main food ..(1)………………. Doctor ? Doctor :Those are protein, carbohydrates ..(2) ………………. and vegetables, dairy and fats. Adel : What are dairy foods? Doctor ;They are foods that have a lot of ..(3)………………. in them, like milk and cheese. Adel : Yes, milk and cheese give us strong bones and ..(4)………………. don't they ? 13-Shop assistant : Can I help you? MrYasser : Yes, please. I'm looking for a good jumper. Shop assistant : What (1)........................... this one ? MrYasser : Is it made of (2)............................ ? Shop assistant : Yes, it's made of good wool. MrYasser : How (3) ................. is it ? MrYasser : Ok, I will take it. Thank you. 14-Salma :Hi, Fatma.You look worried. Where are you going ? Fatma : I'm going to the ..(1) ……………………. Salma : What's (2)...................... with you ? Fatma : I have a very bad cold. Salma : I hope you get (3)……………………. soon. 15-Soha :Hi, Nada ! How are you? Nada :(1)......................... I'm going on a holiday. Soha :(2) …………………..are you going ? Nada :To Luxor. I'll leave on Friday. Soha :How(3)…………………….. will you stay there? Nada : For two weeks. 16-Aya : What is the matter, Asmaa ? Asmaa : (1) ……………………. a headache. Aya : Oh ! Did you see a (2)...................................... ? Asmaa : Yes, I did. Aya : What did he (3) ………………………. you ? Aya : I hope you get well soon. 17-Ali : How are you ? Alaa : I (1).............................. fine thank you. Ali : (2)............................ do you go to school ? Alaa : I go to school by (3) …………………..
Ali : Do you like (4)........................... school ? 1-Aya : What's your favourite sport, Menna? Ali : Desks are made of wood. 3- Yasmin : I want to lose some weight. What can I do? Zeyad : Tennis is my favourite sport. 5- Mariam : How can I get fit? Patient : I have a bad headache. 7- Ali : Can you give me a pen, please? 8- Farah : Which ……………………………………………………………………………………………? Malak : The TV is bigger than the radio. Dr Ramy : Yes, it is very important eat to healthy meals every day. 10- Adham : Which kinds of food give us strong bones? Hagar : Yes, smoking is very dangerous. 12- Doria : I want to lose some weight. What can I do? Tarek ; It comes from rubber trees in Brazil. 14- Ahmed : What's your favourite subject? Nada : I go to school in our car. 16- Ramez : What is the biggest city in Africa? 18- Old lady : Can you help me get off the bus, please? 19- A doctor : ………………………………………………………………………………………………………….? Patient : My back hurts and I have a headache. 20- Ali : Where are you from? Nader : I think electric cars won't pollute the environment. 22-Rahma : What's the matter? 23- Shady : I want to Lose some weight ………………………………………………….? Basel : Don't eat sweets often. Hala : I like painting in my free time. 25- Hesham : What is the difference between a computer and a laptop? Hesham : I'll buy a laptop then, because I travel a Lot. Ramy : It is a new mobile. Mounir : I'm looking at a picture of some things on a museum website. 28- Magda : What is this bag made of? 29- Rami : What's your nationality? Samira : No. my father is a doctor. 31. Amina : Do you think we won't need doctors in the future ? Amina : I agree. We always need doctors. Haney :If it's very hot this weekend, I'll go to beach. 33. Noura :What happens if you touch a hot pan ? Nagy : Yes, fruit and vegetables are healthy. Hoda : Yes, sure. I can help you. Maha : A computer is bigger than a laptop. 37. Karim : ……………………………………………………………….. ?. Tamer : Lake Nasser is about 12 kilometres wide. Doaa : Yes, I speak English. 40. Mustafa : I want to live a healthy life. What can I do ? Mohamed : I ate lunch at a cafe and now I've got stomach-ache. 42.Baher : Where can we get wood from? Baher : Yes, That's right. Noura : You must be careful when you cross the road. Nancy : Thanks for your advice. 44- Mother : What are you doing, Mona? Karim : This car is made in Japan. 46- Ali : ……………………………………………………………………. ? Ashraf : Martin Cooper made the first call on a mobile phone. Student : It is a disease which people get from drinking dirty water. Sales person : It's thirty five pounds. 49- Teacher : Do you like the story "The Iron Man"? Walid : I'm angry because I missed my train.